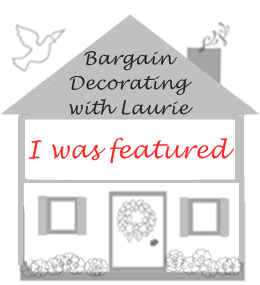 BARGAIN DECORATING WITH LAURIE: HOW 'BOUT A LITTLE CHATTING WITH THE BARGAIN HUNTING? 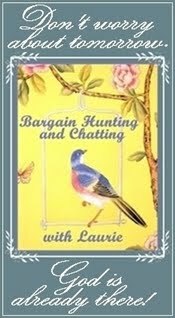 HOW 'BOUT A LITTLE CHATTING WITH THE BARGAIN HUNTING? Yes, I AM showing my mantel AGAIN! This is the way it looked last week. A lot of you bloggers have been posting these great beach-themed vignettes, so I thought I’d try one on the mantel for a summertime look. If you have been coming to my blog for very long, you know that my self-confidence level is lacking (I know -- That’s an understatement!). I had to take site meter off my blog, because I was constantly worrying about all of those people who came to my blog and found nothing worthy of a comment, so I’ll probably be removing the BF recent visitors box as well. Did you notice your tea cup and saucer? I got the last two of those at T. J. Maxx recently (on the sale aisle, of course). Another thing I want to chat about is my criminal activity (as confessed on my previous post). I just want to explain that I would understand and immediately remove a photo if a blogger did not want it posted on my blog. I will not be offended if a blogger emails me and asks me to remove their photo from my blog. Unfortunately, I am one of those people who works better under pressure. I do not pre-schedule posts (I’m doing well to get a post done in time for a Blogville event.) When I prepare a Favorite Things Saturday post, I don’t have time to email each person whose photo I am stealing borrowing and hear back from them before I need to get my post done. So please, email me if you find your photo on my blog and you want it taken off. I have to issue an apology now. I feel absolutely terrible, but I ordered this cute banner from a blogger (apparently not from an Etsy, since I’ve gone back to check my Etsy orders), and I cannot remember which blogger it was! Yikes! I’m afraid I’m not having senior moments – I used to have those, but now I’m afraid I’m senile! I do know that the beach picnic bookmark was from Fifi Flowers Designs (Maybe I’ll remember who made the banner before I finish this post!) If you made this darling banner, please let me know, so I can credit you with it, and please forgive my senility! I told you I was a joiner! Thanks to these great hostesses! 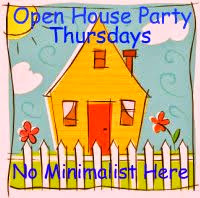 And don’t forget the parties! Friday is the Summer Cloche Party at A Stroll Thru Life, and Friday and Saturday is the Ice Cream Social at Kitchen Bouquet. Social calendars are filling up all over Blogville this week! So, if I have “borrowed” one of your photos for a Favorite Things post, please feel free to post this button on your blog. If you click on this button on my blog, you will see a list of the blogs from which I have “borrowed”. i had a rather nice visit. love the tea :) very delish. the banner is cute. going from color to white can take some getting used to. it looks nice any how. I think your mantle looks lovely, but I would miss the color. I love your apology. So cute! I have your 4th of July plates. I got them from a swap. Don't you just adore them? I wish I had found them at Tuesday Morning. I always enjoy coming by your fun little place. Love your newest button. You're just so clever. 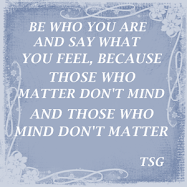 I have a site meter on my blog and get tons of traffic from people who don't comment. I think that's just the way it is. Loving the new mantlescape. I especially like the sandcastle--I've never seen anything like it! I saw the banner at the top and was going to ask where it came from! ALL SO very cute! You are fun to stop by and visit! Have a wonderful week! I'm swooning over that mantle Laurie, as I always do when I see it. You have SUCH a flair for detail when it comes to decorating. I love all the little Laurie touches. I am so sorry! I just realized that I forgot to link back from 'A Swedish Intent!' I fixed it! Thank you so much for stopping by! I want to add that I love this little 'Sea Shore' bucket...I have a vintage child's beach shovel that would pair nicely (I love children's antique toys, furniture,etc...!) So lovely! 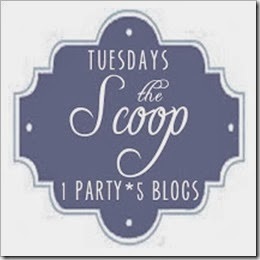 Thank you for the list of parties going on in Blog Land. I have been MIA this summer, out for Daycations and trying to create some things. Love that banner, and Fifi is such an amazing artist, I can't believe how many things that she produces each week. Well have a great day, and thank you again. I didn't know about some of these. I love your beachy mantle! I don't change mine except for Christmas or other holidays I put a few seasonal items in between the always displayed photos up there. Boring,I know! I love those teacups. I would have had to buy them if I saw them! Laurie, your mantle always rocks! I love the patriotic one, and the beachy one is just gorgeous, and I can't wait to see what you'll do next! Good morning Laurie! Well I did enjoy all your true confessions and chatter here. So sad none of your photos showed up for me. It's probably some glitch on my computer thinking it's saving me from something. I'll come back again and see if I can see the photos, too. I always love visiting here...we have the best talks...even if they are one sided;)! 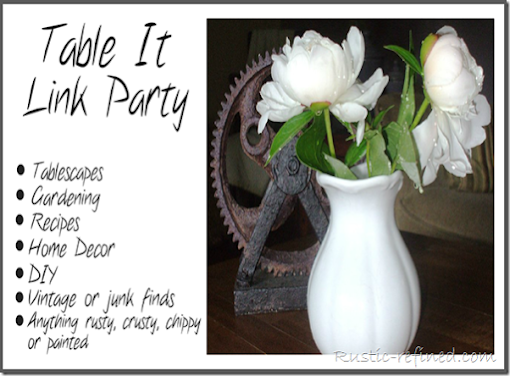 You really know how to entertain a girl... beautiful decor and amazing refreshments! Can I come again soon? How 'bout now? I am on my way! I love the sea shell plates on your mantle, and the sandcastel and vintage bucket. It's a very pretty summer vignette. Love the beachy look. I am not a big Americana fan, but your mantle looked nice. I love getting bargains, too, and those tea cups are sweeeeet! I enjoy your blog very much, Laure, Thanks for the tea! What a beautiful mantle, pretty elements in there. 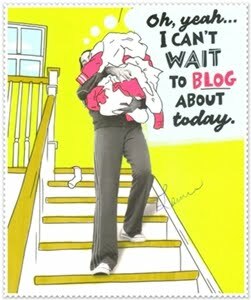 Oh my gosh - your blog button is a hoot! I hope you'll steal one of my photos soon so I can put your button on my blog. And BTW - you should get your confidence level up right now, because your blog is wonderful. I love the fun you put in your writing. Your tea cup is so unusual! I love the colors and the starfish shaped saucer. How cool is that for summer! Thank you for joining in Tea Cup Tuesday. You are so sweet, I can't imagine anyone every getting made at you! I love the mantle both ways you have it! I enjoyed my visit. Thanks for the tea! beautiful mantel and your teacup is so unique.. never see one like yours! starfish saucer?! wow.. that is super cute! Love the beach scape! I have had one displayed in my front foyer for over a month- you know, in preperaton for summer! Wow!.., What a lovely mantle; both ways are just so delightful it's hard to pick a favorite! 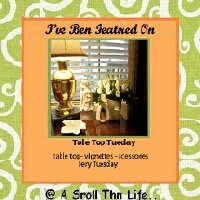 Thanks so much for joining in with the tea party fun for my 39th, 'Tuesday Tea For Two', the 30th, 'Wednesday Tea For Me And Thee' as well as for my shared meme that I created to share with my dear sweet friend Pam; our 11th, 'Teapot And Tea Thimgs Tuesday'! 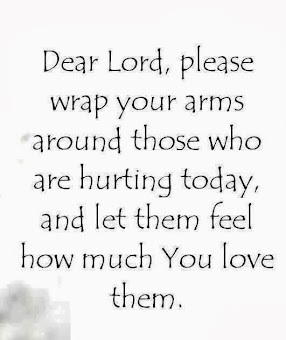 Have a marvelous and blessed week! First time visiting you and I most said it was very entertaining and amusing. Love your chatting……and the new look on your mantel. Laurie, I like the neutral, beachy look! The banner is adorable, as are those plates. What a cool sandcastle- is it a lamp? Your mantle is lovely and very summery, and I have never ever seen a cup like that what a unique find. Your beach theme mantle is great. I love the china scallop shells, sandcastle and the banner. I wish that I'd bought some of those starfish cups and saucers when I saw them at Marshalls. Oh you do not ‘monopolize the conversation till we get to the comment section’. Laurie, you regale us with stories of your criminal history and present beautiful photo’s of your teacups, mantle, your home, your bargains, your finds, your family, and so on. It is our pleasure to sit and ‘listen’ till it is our turn to thank you for being such a good hostess and entertaining us all with your wit and charm every Tuesday. You are a delight. Take care. What a cute tea cup and saucer and I love your mantle, both decor themes!! I am a lover of deep rich color . It is not that I don't like the white Shabby thing, I do .... in someone else's house! I get bored with things very quickly and all white would simply just bore me to death after a bit of time. Plus I would feel that I would have to be extra careful not to get anything dirty because it would really show up on all of that white. And I truly don't have time to be that careful!! Sorry that I monopolizes this conversation for so long! LOL!! I like your mantel makeover Laurie! 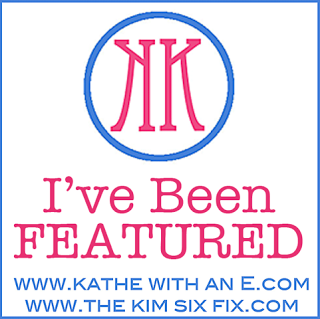 Your blog is like a treasure trove of wonderful things to see! I end up going all sorts of different places I never would have found on my own. funny funny! I have to admit I don't know how lots of those things work either! I love the white mantel it is just beautiful. Chatter away my dear....let me get another cup of coffee. I see that bloggerville prison still allows for home vistitations to get the important stuff done in life! Now, I need to know, did Martha leave some of her design books in her cell and you have been studing them? Because the mantel is beautiful. Unless of course, this is just part of the "rehabilitation" training you are receiving. Now, I want to take full advantage of your blogger jail time. I figure you are probably meeting all kinds of blogger techies in there. So, when you find out about what the whole BlogFrog, please let me know! I, too, signed up for it without having a clue what it is all about and I receive daily emails from people now being my blog frog friend. I'm clueless. So, could ya get on that the next time you have maybe "yard time" in bloggerville prison. Maybe while one of the computer people, in between bench pressing their laptops, could answer this mystery for us. Oh, and I am taking my button! i am loving your chairs in front of the fireplace! so cute! the mantel looks great in the 4th & the beachy decor. that little bucket is too cute! bff stands for best friend forever..something i am just now learning, too. I always love the way you dress your mantle!! And I have a very similiar banner I'm going to use this weekend for my little one's 2nd birthday party! I'll be sure and take pics of it! Thanks for stopping by and leaving such kind comments. I enjoy your blog and really heart those cups & saucers that look like starfish! Your chairs are pretty special, too! Laurie- just back from our Jr High camp and since it is terrible warm today I am playing lazy and catching up on my blogs! Always so fun to come by and see what craziness you are up to! I am so glad you mentioned BF and BFF for I too joined but when I would see BF thought someone was talking about their best friend though then I thought my they have a lot of those as every other person is BF! Now the BFF- best friends forever??? 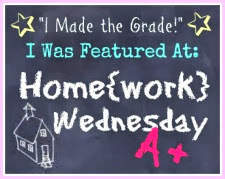 What a silly and cute little feature button and I will proudly place it on my blog page!